"Any student of history could have a field day in the archives of the Museum, particularly students of the history of wine. 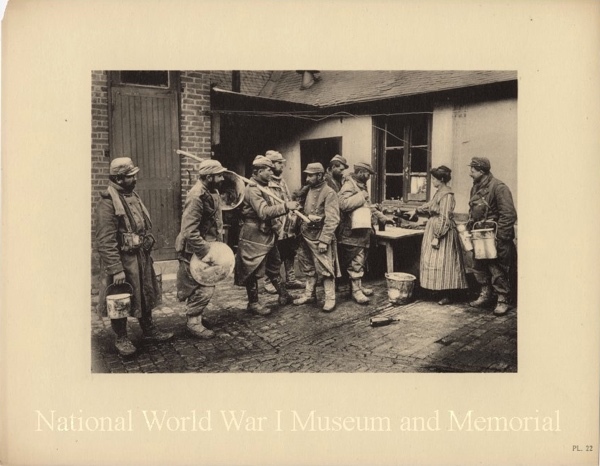 Browse the online database of the collection, and some of the images you'll find show people (soldiers and civilian) consuming wine during the war; trains with large barrels on them that are marked "Champagne"; scanned images of labels from bottles that soldiers drank then peeled off as souvenirs; and, of course, pictures of various regions (particularly northeastern France, Belgium, the northern borders of Italy, and Germany) that show the destruction of buildings and landscapes, including vineyards, over the course of the war." The photograph below, captioned "Soldiers leaving the trenches", shows soldiers holding food tins while a woman pours wine.